If you have any questions regarding the pre-planning of a funeral, don’t hesitate to contact one of our compassionate and experienced funeral directors. 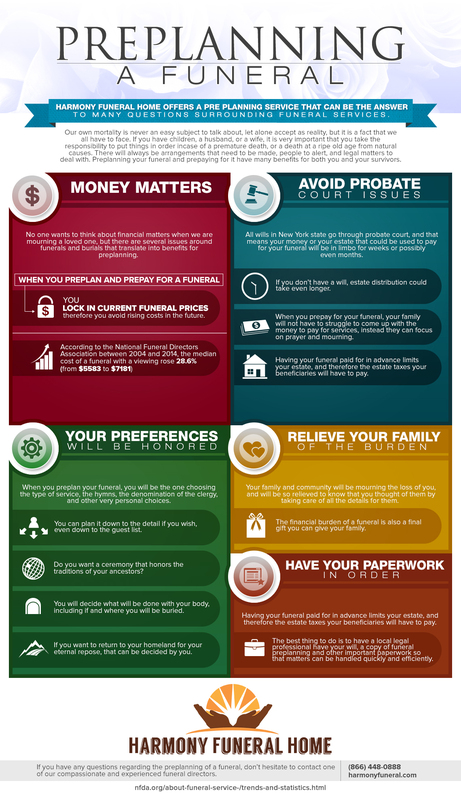 No one wants to think about financial matters when we are mourning a loved one, but there are several issues around funerals and burials that translate into benefits for preplanning. When you preplan and prepay for a funeral, you lock in current prices, therefore you avoid rising costs in the future. According to the National Funeral Directors Association, between 2004 and 2014, the median cost of a funeral with a viewing rose 28.6% (from $5583 to $7181). All wills in New York state go through probate court, and that means your money or your estate that could be used to pay for your funeral will be in limbo for weeks or possibly even months. If you don’t have a will, estate distribution could take even longer. When you prepay for your funeral, your family will not have to struggle to come up with the money to pay for services, instead they can focus on prayer and mourning. Having your funeral paid for in advance limits your estate, and therefore the estate taxes your beneficiaries will have to pay. When you preplan your funeral, you will be the one choosing the type of service, the hymns, the denomination of the clergy, and other very personal choices. You can plan it down to the detail if you wish, even down to the guest list. Do you want a ceremony that honors the traditions of your ancestors? You will decide what will be done with your body, including if and where you will be buried. If you want to return to your homeland for your eternal repose, that can be decided by you. Your family and community will be mourning the loss of you, and will be so relieved to know that you thought of them by taking care of all the details for them. The financial burden of a funeral is also a final gift you can give your family. The best thing to do is to have a local legal professional have your will, a copy of funeral preplanning and other important paperwork so that matters can be handled quickly and efficiently.